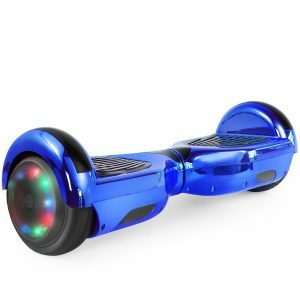 1 What is a Hoverboard, exactly? 4 How Did We Choose? 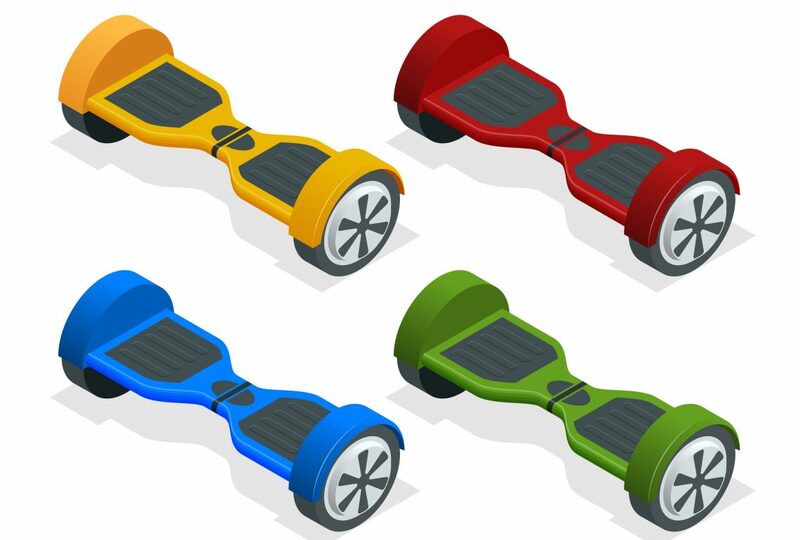 6 Buying Guide – How Can You Decide Which Hoverboard is Best for You? Back to the Future II told us we’d have Hoverboards by the year 2015. Well, it’s 2019 now, and what we have seems almost like a cruel joke compared to what the movie portrayed. Our hoverboards do not actually hover, for instance, nor do they ride like skateboards, but that doesn’t mean they aren’t pretty cool either. Still, you constantly hear bad stuff about them, don’t you? Patent infringements, low build quality, recalls, lawsuits—it goes on! 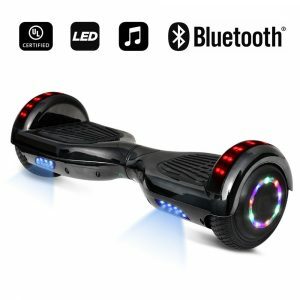 This begs the question: Is there such a thing as the ‘Best Hoverboard’ out there, or should you just blindly waste your money on a random one since you’re running the same risk with any given one you could buy? Well, we’re here to clear that up for you, so buckle up and enjoy our ride through the various makes, models, and brands out there while we figure out which one, if any, truly is the best! What is a Hoverboard, exactly? Depending on whom you ask, a hoverboard is either a vehicle, a tech gadget, or a toy. In more absolute terms, though, it is a two-wheeled machine, with one motor driving each of those wheels in most cases, that gains traction through the rider standing on it and that is able to flex and react to terrain much like the suspension system of a bike or car through a joint in the middle that freely rotates, but can often be locked in place depending on the riding style. Hoverboards are ridden for showing off one’s style-consciousness, for performing tricks to wow audiences or as a unique, idiosyncratic means of getting from point A to point B. What many buyers aren’t usually aware of before purchasing a hoverboard is that there are two distinct designs that are often both referred to as ‘hoverboard’, despite being completely different devices for different needs. 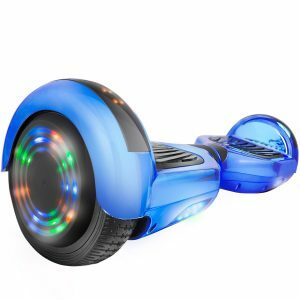 First, there’s the two-wheel self-balancing scooter, what most think of when saying ‘hoverboard’ nowadays. It is equipped with two wheels driven by electric motors, as the name implies, with a rotating joint in the center and pressure pedals for the rider to place their feet on to transmit sufficient weight to the ground for the wheels to grip. On the other hand, there’s the Airwheel, also often referred to as a ‘hoverboard’. It is much rarer than the self-balancing scooter, though most manufacturers of the latter also sell the former. Unlike the more traditional scooter-type design, the Airwheel is a unicycle, with two protruding pedals for the user to place their feet on. As on the other design, the wheel takes its traction from that weight and the balance from a built-in gyroscope. Among Airwheels, there are many designs. Some look like motorized pogo sticks, others more akin to the rear end of a motorcycle that’s been chopped off. Whatever the case, riding an Airwheel is fundamentally different compared to riding a twin-wheel self-balancing scooter as, with the former, how you position your torso becomes much more important, while many tricks are significantly easier to perform with the latter. Here are some top-rated electric hoverboards below. From the name itself to the way it looks and its vibrant marketing campaign, everything about the GOTRAX tells you it’s a high-end product among hoverboards that desperately tries to set itself apart from most of the Far Eastern competition—one could invent a drinking game around the phrase ‘Designed in Denver’, which appears almost everywhere in the GOTRAX’s PR material. We have to say, it succeeds astoundingly well. The fit and finish is much better than what you’d expect, and there are loads of color and material trim choices, too! Furthermore, the Hoverfly, being designed and sold as the more affordable cousin of the enthusiast-grade Hoverfly Eco, is still very clearly targeted towards those who know the ins and outs of hoverboards like the backs of their hand. Unlike many others, GOTRAX does publish all the technical info surrounding their product right on their website for everyone to peruse or gawk at, from top speed a very generously high 7.5 mph to range on one charge, which sits at a respectable 12 miles. All in all, the Hoverfly is not just well-built, but a great performer for those who know how to make the most of its strengths, as well. The high price of $180 becomes easily understandable this way, as the niche demographic GOTRAX is targeting here with the Hoverfly would probably not even want to pay any less. However, for the common Joe, this can be a problem of sorts. Truth be told, the Hoverfly wasn’t made for them in the first place. It’s made for the kind of people who know what a Tootsie Roll is and who can actually pull one off blindfolded. For them, it does its job admirably. For the rest, who may just want a nifty little self-balancing scooter to play around with or ride through town every now and then, the Hoverfly will most likely be too much for too little gain. To pull off sweet tricks with a machine one can trust and rely on, that is what the Hoverfly was clearly made for. Casual riders might also want to check it out, but be aware that there might be better deals out there tailored more closely for your demographic. Hoverheart is one of the biggest original hoverboard manufacturers, as far as one can use the word ‘original’ in this context, and has been in the business longer than nearly anyone else. Their products are usually not very feature-laden, but also not as unreliable as those of some of the other big Chinese brands out there. A nice all-around option, then. This particular model, available in a variety of colors, comes with built-in LED illumination, mostly to show off, but bright enough to actually light the road just slightly ahead of you when you’re riding in darkness. With six-and-a-half inch tires, towards the lower end for mainstream hoverboards, the Hoverheart glides smoothly, is easy to pick up and has just enough traction to do some neat tricks with, if that’s your thing. It carries up to 180 pounds, which is quite a deal considering the device itself, being made mostly out of plastic, barely puts a fraction of that on the scale. Also, Hoverheart makes some extensive effort to make sure you understand this board is fitted with ‘anti-explosive’ batteries. Now, there actually is no such thing, but we presume they simply mean that all batteries are proofed for a low degree of flammability before being installed. This harkens back to an incident in 2016, where thousands upon thousands of hoverboards had to be recalled due to, you guessed it, exploding battery packs. However, if there’s one thing bothering us about the Hoverheart, it’s the price. For a fairly standard hulk of cheap synthetics that is arguably not going to last too long — the chromed plastic exterior alone can collect dozens of unsightly scratches in a few minutes— $135 seems a bit much to ask. It’s not that the Hoverheart is expensive—it’s actually pretty affordable by hoverboard standards—but this basic a package is not worth the tag when you can spend about $20 more to get a truly high-end offering loaded with all the features you’ll ever need. 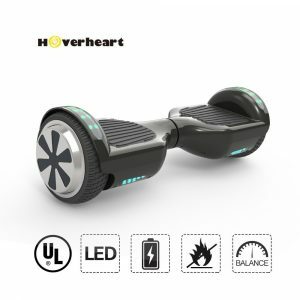 In conclusion, then, the main thing that will be holding most back from going for the relatively straightforward Hoverheart Self-Balancing Scooter is the price. Way over $100 is just too much to ask for such a basic, medium to a low-end board, and most buyers won’t readily jump on the bandwagon just because of a well-known or trustworthy brand name. Furthermore, smaller nitpicks, like the subpar build quality, also contribute to the Hoverheart’s unattractiveness as a money-efficient investment. Bummer, actually, as the board itself isn’t half bad; not even close. On the subject of enthusiast-grade hoverboards, SWAGTRON is king in this department. Not only do they offer an expansive resource on their website full of tips and tricks for both newbie and pro hoverboard riders, but they make their own hardware, too. Since they’re targeted chiefly towards the crowd of tricksters and performers who want to get the most spectacular out of riding their boards, it is no surprise that their own models are some of the most well-made and top-performing on the market. Prices in excess of $200, which might sound ludicrous to the casual buyer, are not only not uncommon; they are the norm. The T580 is not SWAGTRON’s range-topping model. In fact, it is one of their entry-level devices. Still, it packs more punch in a more intimidating package than the vast majority of competing boards on the market today. Not only can it go blisteringly fast—up to 7.5 mph—but it can also climb steep 30-degree inclines and support up to 220 pounds of weight. Since it is mainly intended for high-performance, short-distance scenarios, the T580 doesn’t have a high-capacity battery pack, but still manages to last for about 8 miles on a single charge, which is considered above average overall. The T580’s party trick, however, is its smartphone integration. Usually, a feature reserved for top-of-the-line models, the SWAGTRON packs a full, Android and iOS-compatible command and control suite right out of the box. You can manage nearly every imaginable setting from that app, like setting a top speed, controlling sideways twists and turns, observing your charging level and more. Since the whole thing literally fits in the palm of your hand, experienced riders can use the app to manipulate the board while riding it and doing tricks simultaneously. And, in case it hadn’t already been obvious considering this is a $200+ hoverboard we’re talking about, the T580 comes with an excellent, multi-layer, dual-tone exterior finish that is treated inside and out to be fire-resistant and safe against electrical hazards. The battery packs are also heavily proofed to further enhance protection. As with the Hoverfly above, most casual riders will find the SWAGTRON to be decisively too much in nearly every aspect, especially price. However, even if that isn’t a problem for you, there may be a few other small things worth mentioning just before you pull the trigger. Do consider the low range, for one; it is there for a reason, but may still pose some problems depending on how you want to ride your board, and how much. If you can afford it, the SWAGTRON T580 is everything you could want a ‘budget’ board like the Hoverfly to be. It is nearly perfect, and most of that ‘nearly’ comes down to its relative inaccessibility, high price, and the fact it was made for a small niche in an already tiny market of devices, which means few are ever going to learn to enjoy this one the way it was meant to. Now, having looked at the best of the best, how about we turn our gaze back towards some more casual-friendly products, some that are lighter on the wallet and the mind? And, to be honest, that the above sentence would be a really good way to sum this board up. It is cheaply made, yes. Thanks to the overuse of LED lights all over—there are even RGB LEDs on the hubcaps, for crying out loud! It is also very flimsy to use, but mainly if your definition of ‘use’ includes a few One-Eighties followed by a Butterfly and Roundabout. For those who have no idea what that means and just want to cruise, the SMART GO is more than okay; it is actually a really nice casual board. However, there are some gripes we had during testing. First, there’s the issue of power. Not only does the SMART GO have huge motors that produce much more torque than they really need to, propelling the board up to 10 miles per hour where it becomes nearly entirely uncontrollable, but that immense speed also robs the AOB of nearly all the battery life it might have otherwise had. Couple that with small, 6.5-inch wheels, and you have a hoverboard that’s more difficult to maneuver around than it really needs to be. Oh, and about that battery life: One charge lasts barely an hour, and recharging does take 2 to 3 hours, give or take. If you’re looking for a budget board that can still perform well, the AOB SMART GO may very well deserve to be on your list of top contenders. If you color yourself a pro rider, though, it becomes less of an appealing proposition. This is mainly a scooter for those who just want to cruise around for fun, not pull off exciting moves or bring the hardware anywhere close to its limits. True, the name itself might be confusing to some, but the board behind it certainly isn’t. At $160, and available in nearly every color scheme in the universe, this is an everyman’s board by every metric. It doesn’t excel at anything in particular, but that’s what it was made for; to be the quintessential all-rounder. With a modern, sleek look and premium metal accents, most prominently on the hubcaps adorning the grippy 6.5-inch tires the ION comes with, it is clearly designed to appeal to a wide audience. There is nothing gaudy or extrovert about the ION’s appearance, which is not the case with many similarly priced boards that is directed at you, AOB, to name just one. The LED lighting, included with nearly every board nowadays mainly for show, is actually designed first and foremost for functionality on the ION, to light the road ahead, and is positioned accordingly, glowing in a bright white instead of the crazy RGB colors we’re used to from others. Performance-wise, the Levit8ion is not a high-speed racer but still manages to clock in about 8 and a half miles per hour under optimal conditions. The internal battery doesn’t just feed juice directly to the wheels, though; the ION also has an integrated Bluetooth speaker, to connect to your phone and allow you to listen to music while you’re riding. While nice to have and certainly very convenient, this specific implementation does negatively affect battery life. By a lot. The ION can barely go on for 6 miles before running out of charge, which is just about below the total average, certainly much below for a board of this price and quality level. Also, due to the fact that the ION is so decisively a middle-ground between enthusiast boards and more casual-oriented models, it may not appeal to many users for its lack of features catering to specific demographics. If you’re new to hoverboards, the levit8ion is a great place to start. It offers you all you’ll need, and at a great price and quality at that. For those who already have some experience, though, no matter what kind, the ION’s shortcomings of failing to cater to the needs of more advanced riders will quickly become apparent. RGB lighting all over the place? Check. Bright, neon plastic frame with a chromed exterior coating? Check. Low price? Check. The XtremepowerUS hoverboard is chiefly targeted towards the more casual side of the market, those interested in style over substance, even if only slightly. However, that doesn’t mean performance is terrible, and the effort the manufacturer has made to make the XtremepowerUS actually capable when used by a true pro is commendable. Top speed lies at around 8 mph, just about where it should be, but battery life is not severely compromised as you would expect, and one can go on for about 10 miles on a single charge, more if you’re lucky. Maneuverability is good, especially for the price, but the XtremepowerUS has trouble with inclines. Steeper than 5 degrees, and it just won’t climb up, despite the torquey 250-watt twin motors. Being a budget board, this one does feel a bit flimsy when performing any kind of maneuver, but for general use, it should be stable and controllable enough. Even for pros and those aspiring to be, it is responsive enough to pull off some neat tricks here and there. This all does come at the cost of build quality, of course. Simply put, the XtremepowerUS is cheap. Very cheap. It’s not a good investment, even if only due to the chance of it breaking by itself is being so much higher than on a higher-quality product. Also, the problem with inclines hurts its performance and prevents the XtremepowerUS from being able to perform some advanced moves. 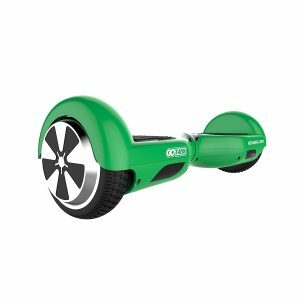 For budget and style conscious buyers and within this market segment, there sure are many — the XtremepowerUS self-balancing scooter is a perfect choice. Offering just enough practicality to be a useful vehicle and show-off machine at once, while maintaining that daring attitude that all trendy boards seem to possess, there is nothing major to complain about on the XtremepowerUS if that’s the kind of perspective you’ll be buying it from. However, do look out for some build quality problems and nearly non-existent performance on inclines. 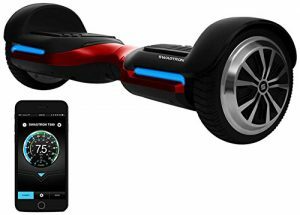 From the name alone, you could guess this was made for a slightly younger, less experienced audience than most hoverboards, but if that wasn’t enough, just take a look at the SWAGTRON T1’s marketing campaign. From child-oriented extras, like a dedicated ‘Learner’s mode’ that softens and simplifies the controls to make them more beginner-friendly, to enhanced safety specification adhering to the UL 2772 Standard, to relatively conservative performance specs, everything about the T1 was clearly designed for an optimal mix of fun and safety with young teens in mind. Still, that doesn’t mean the T1 doesn’t pack a punch for those who know how to control it. With a top speed of 8 mph, which can be lowered on user input through the aforementioned ‘Learner’s mode’, and a maximum range of some respectable 12 miles, the SWAGTRON isn’t half bad, especially not for a beginner’s board. Despite all the chromed plastic we’re all so used to from cheaper boards, we found the tires and rims installed on the T1 to be of very high quality, as are the anti-slip footrests. Unlike many beginner’s models and budget devices, the T1 also has no problems whatsoever with inclines. Nothing up to 30 degrees poses any challenge whatsoever; no wonder given the powerful 250-watt motor. Yes, that’s a singular—the central motor design is what gives the T1 its unique blend of power and energy efficiency. There is also a built-in Battery Monitoring System, or BMS, which, thanks to small LEDs embedded into the frame of the board, communicates vital safety info to the rider. In spite of all this praise, the SWAGTRON is not without its flaws. First and foremost, the price. You’d expect a board like this, one aimed chiefly towards beginners and young’uns, to be pretty affordable, right? Well, to put it simply, wrong. The T1 goes for around $250, and the higher-performance models of the T-series are even more expensive than that. 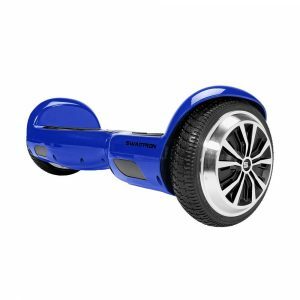 This is at least partially justified in the great performance, accessibility, quality, and safety contained within the SWAGTRON package, but for many, this will simply be too high an amount to spend on a hoverboard for their child. If you’ve got the cash to spare, the SWAGTRON T1 is a great choice, and despite being a board made for young newbies, it performs equally as well when pushed to its limits. A great all-around choice for everyone, then. Everyone that can afford the thing. Sometimes, a cigar isn’t just a cigar. Sometimes, a hoverboard isn’t just a hoverboard. This is very much the case with the TOMOLOO here, a self-balancing scooter that brags as much about its performance as it does about things no-one else would have even thought to put into such a device. From a high-grade, multi-speaker Bluetooth sound system to waterproofed rubberized all-terrain wheels, to an integrated chipset with numerous sensors that adjust LED lights and the internal motors depending on acceleration, the angle of attack and other factors, the Q2-C is a beast of a board. It also features some safety features we’ve seen from other models, such as a child-friendly learner’s mode which brings the performance down some notches. Style, though, is just as important as the substance with the Q2-C, if not more. That is why it includes a full RGB LED lighting suite that can be user-adjusted and set up in any of a long list of customizable lighting patterns. The lighting, along with most other settings and user-defined parameters, can be configured within the bundled Smartphone app that is directly tied to each individual TOMOLOO via Bluetooth. An experienced rider can use both their phone and feet at the same time to pull off some advanced maneuvers that would be otherwise impossible or too difficult. For what you get, $200 seems like more than a fair price, too. Then, on the flipside, there are some problems worth mentioning. Ever heard of TOMOLOO before reading this article? Probably not. They’re not exactly the world’s most prolific manufacturer of hoverboard’s, you see. They aren’t even a manufacturer of hoverboards, per se. They mainly make skateboards, both powered and non-powered ones. The Q2-C, their only hoverboard in the lineup, just happens to be there in their catalog, for no apparent reason. With this in mind, the Q2-C’s build quality is questionable, especially given the fact that TOMOLOO as a company doesn’t have any facilities purpose-built and equipped with the proper machinery to manufacture hoverboards in particular. Or, to make a long story short: Holding the Q2-C in your hands alone feels a little fishy. Riding on it at 8 mph feels like playing with death. Would you still risk it just because of an attractive price? If you’re willing to take somewhat of a risk, then buying a TOMOLOO hoverboard might just turn out to be one of the best deals in electronics we’ve seen recently. However, the way it’s put together, the relative no-name status of its manufacturer and some obvious flaws in manufacturing alone are enough to put us off from entrusting TOMOLOO with our hard-earned dollars. But what about you? Willing to take the plunge? No, this is not the product we reviewed above. That one doesn’t have the word ‘electric’ in the name. In all honesty, it would do Hoverheart some good to come up with more inventive names for its product line. In any case, this hoverboard, priced at an extremely low around $138 and sporting a very professional, almost futuristic design with many exposed metal elements even if the majority of those are actually chromed plastic certainly makes an impression. It’s designed with both newbies and pros in mind, though it obviously caters more to the former. With a top speed of 10 mph (Depending on road condition and rider weight), it will get you where you’re heading, but it’s not exactly brisk in terms of speed. It does, though, have a very stable, UL-certified battery system that can last for over 12 miles if used conservatively. This is surprising given the high draw of the twin 200-watt motors embedded into the Hoverheart’s stylish metal hubcap covers. Ground clearance of 0.98 inches & platform height is 4.5 inch is optimal. With such a low price, there is a consequently high number of questions one could have about the quality of the Hoverheart. Fortunately, it checks most of the right boxes, from build quality to straight-line performance. However, customer support is not one of them. You don’t even get a proper warranty. There is no help hotline, and no way to exchange a faulty product for a new one without paying for it twice. That, in today’s world of Amazon and eBay-style online shopping, is unbearable and unacceptable. As a product, this Hoverheart board is a perfect beginner’s scooter that can work very well when used by pros, too. Unfortunately, the nearly complete lack of any kind of support by Hoverheart puts a huge dent into the board’s attractiveness. Perhaps a multi-year warranty would be a good start, no, Hoverheart? This budget board by little-known East Asian brand CHO comes in at $150 and sports a relatively standard, modern look with lots of RGB and lots of curves. With integrated Bluetooth to facilitate a Smartphone connection, UL-certified fireproof batteries, and exterior panels as well as a built-in speaker system and status LEDs, it is a pretty well-equipped piece of kit for its price. Available with both standard 6.5-inch wheels as well as larger 8-inch and 9-inch All-terrain designs that help with riding on gravel, sand and other rough surfaces, the CHO is more versatile than many other models, too. As a promising alternative to the Hoverheart above, it also comes with a 1-year warranty. Not excellent, but certainly a step ahead of the competition. Available in a wide range of colors, and with its user-configurable RGB lighting system, the CHO can fit in with nearly any kind of style or outfit. It’s also very light at just 25 pounds, meaning it won’t be any hassle to take it with you wherever you go. On the other hand, there are risks connected to buying a CHO board, and once again, the product itself is not at fault for this. Simply put, East Asian manufacturers don’t have a great reputation in this niche, as they seldom do overall. True, the CHO has a good warranty, and customer support is said to be great, actually, but still, Asian design permeates throughout the board. It’s definitely different than many of the high-end Western brands in terms of its feel on the road and its appearance out on the street. If you know what kind of statement you’ll make sporting a CHO, though, and are willing to go down that path, then there’s barely anything stopping you. Though it’s not for every taste, the CHO 6.5-inch hoverboard is a great scooter for nearly all types of riders. If the design resonates with you, go grab one to try out. Most likely, you won’t be disappointed. Of course, this question has to pop up at some point reading through the above review. How did we actually grade those boards, and how did we choose which to review in the first place? At its core, our methodology is very simple. We cross-reference and compare many boards at first, grabbing them from as large a sample pool as possible, based on criteria such as top speed, stability, features, price-performance ratio, and safety—of course, we test these ourselves unless the option of relying on more accurate numbers specified by the manufacturer is available. We eliminate all those boards that do not score above a certain median average of all these criteria. This alone narrows down the selection to a few mere dozens, down from a few hundred. Then, we simply test the remainder again, this time looking at more specific criteria such as weight, size, customer support, brand reliability, quality control and more. This part of the review process is usually comprised more of research than actual, in-the-field testing. Once that’s done, we again eliminate those that didn’t score highly enough. This leaves us with our final top ten. Not as bombastic or expensive as many high-end SWAGTRONs, but not as questionably put together as the promising, but deeply flawed Hoverhearts, the GOTRAX Hoverfly straight out of the USA surprised us a lot with its blend of quality, high performance, and accessibility. The looks are standard and could suit anyone, but it still is far from boring. It’s quick as all hell too, but not to the point where it can become uncontrollable. It’s maneuverable, but it will never give up on you during a corner, or threaten to overshoot it. Simply put, it’s just ‘right’, mainly for those wishing to put it through its paces, but even for true beginners and casuals, the GOTRAX is one of the most reliable and well-made boards out there. 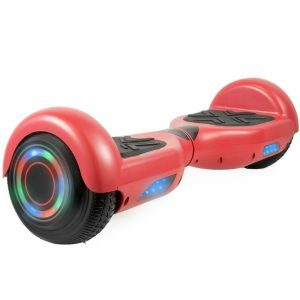 Buying Guide – How Can You Decide Which Hoverboard is Best for You? This is a question we get a lot. To answer it in the simplest way possible, just take a look at the following list of criteria. Go through them with each prospective purchase decision, and assign a score on a scale of one to ten for each board you’re interested in. When it’s time to choose, compare the scores of all the boards you are considering, and pick a winner. Safety first, we always hear people say, and with hoverboards, it couldn’t be any different. Though barely any boards can go faster than 10 miles per hour, that rate of speed feels much faster than it sounds when you’re standing on what is solely a very slim, narrow platform just large enough for your heels, having nothing to hold onto. Safety wear is up to you to pick and choose, but even the board itself can make a big difference. Look for hardware that’s UL-certified — This means that the internals and exterior materials adhere to any of a wide range of US federal standards that specify water resistance, shock absorption, fireproofing and more. 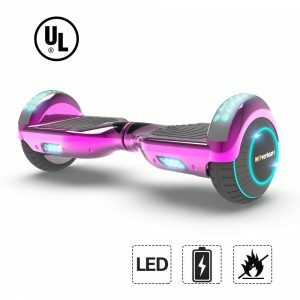 The UL standard most commonly referred to when talking about hoverboards is number UL 2772, which concerns itself with flammability of internal batteries, but the more, the merrier. Almost all boards have a weight range within they can safely operate. Not enough weight on the pedals, and the board will just move around wildly with little traction. Too much, and the motors won’t be able to deliver enough power to move the board at all. Do look this up before making the purchase, just in case. Usually, the operating range for most boards lies somewhere between 40 and 200 pounds. Many boards are intended for younger riders, offering safe riding modes with decreased performance and other youth-friendly features. If you’re a parent and are planning to buy one for your child, it is a good idea to examine just what age demographic the board you’re looking at was designed for to ensure optimal safety and a pleasant user experience. This criterion entails literally anything that doesn’t fit anywhere else, but might still affect the purchase decision. From built-in stability meters to safety programming and remote control options, some advanced boards sport really nifty features that might be interesting to you, so note down anything you see that fits the bill. When talking about cars with enthusiasts, you’ll very often hear them making a very clear distinction between tires and wheels. They’re absolutely correct, but in the world of hoverboards, tires are hardly ever modular, and the wheel they’re mounted onto—often with solder or glue – is often non-replaceable. This leads to the two practically being the same thing when talking about hoverboards. What is also the exact same thing is the size. Forget about 205/55/P10 or any such nomenclature; with hoverboards, there is just one denominator, and it’s the diameter in inches. There are three industry-standard sizes, 6.5, 8 and 10, and numerous non-standard ones besides that. Generally speaking, the tire or wheel size should be as small as possible for tarmac and hard surfaces and as large as possible for rough, soft or uneven surfaces. Try to find a middle ground between the two, preferably with rubber tires marked as All-Terrain, if you plan to ride in varying kinds of environments. Most hoverboards you’ll find being sold online will be equipped with 6.5-inches, which are considered the most popular. This is obviously very important if you’re even moderately experienced, or want to be one day. Many tricks cannot be pulled off properly without some momentum, and many others need the torque that only a high-powered motor can provide. Both of those metrics are not linked to top speed one-to-one, but then again, most manufacturers will only tell you about top speed, and anything else is hard to test without specialized tools. Thus, the board’s speed becomes a very important metric for overall capability. Generally speaking, over 10 mph is considered too much for nearly everyone, while under 6.5 is too slow. This one is also very obviously one of the top things to look out for on a good board. Depending on the manufacturer, this value may be given in miles, as in, how far can you drive in a straight line before running out of juice, or in hours. Miles are usually more convenient, as you can make your own calculations based on how often, and how long, you plan on riding to make a semi-accurate prediction of how long the battery can hold out for in real use conditions. In General, more than 10 miles of range is considered good, and anything over 12 is exceptional. Forget about anything that can’t get to 5 miles without needing a recharge, though. This, coupled with top speed, is one of the most important performance metrics. A high-wattage motor will put out more torque, allowing you to climb steeper obstacles and pushing you forwards with more force, but consequently, it will also draw more juice from the internal batteries. Most boards have two motors, one embedded in each wheel hub, but some sport a centralized setup with only one motor for power efficiency’s sake. Whatever the case, wattage directly affects both the power being drawn from the battery and the power put onto the road, so do look the numbers up and try to find one that suits your needs. Depending on just where you’re planning to take your board with you, you’ll need something that can stand the test of time and the elements. A good, metal-based construction seems like it should be taken for granted, but unfortunately, that’s far from the case. Most boards on the market are built out of cheaply-made, molded plastic sheets layered with a metal-look paint. Of course, this is great for weight management, but much less so for toughness. Your best bet is to look at the battery—Tough batteries, those that are encased in anything but plastic, but lighter metals like magnesium and adhere to more than just the minimum UL 2772—are often only found on scooters that are specifically made to withstand some abuse, as the board itself is more often than not built around the battery, instead of vice versa. Of course, how could we forget about the price situation, it being probably the most important aspect of any buying decision for many? The hoverboard market is not very complicated when it comes to prices. There aren’t many great deals, but not many wallet-fiends, either. Simply put, anything below $100 is good for the trash, anything between $100 and $150 is a budget product, anything between $150 and $200 is regular, and anything above $200 is premium or high-end in some way. Remember that, in such a small price range, paying slightly more for higher quality can pay huge dividends, so plan your budget beforehand, and when facing a tough decision, be prepared to spend slightly more, not less, than you initially thought you would! Accessibility, or Ease of Use, is a very vague term, but what we mean by it couldn’t be more specific: Just how easy is the board to jump onto and ride? Is there any setup needed? Do you need to make any safety precautions due to a user-unfriendly design choice or other? Are the stupid LED lights non-adjustable or impossible to turn off? Things like these, as small and inconspicuous as they may seem, can often influence a buying decision significantly. For this, simply go onto the manufacturer’s website, read a few reviews—we know a place where you can do that, by the way—and note down all the little things that struck you as potentially influencing your opinion of the board. This is, of course, as highly subjective as can be, but try to think about this for a second: Just what kind of statement do you want to make with this board? Whom do you want to impress? Or perhaps you want to be as unassuming as possible? Try to find a hoverboard that suits you first and foremost. Of course, some areas of the design can be practical, too. For example, examine the footrests on the pedals. How large are they? Do they support your riding position? Are they made of an anti-slip material with good enough support? Do examine as many areas of the design as possible using this strategy. Bluetooth is used for a variety of purposes, and that holds true on hoverboards, too. Most boards use Bluetooth for a built-in speaker system, a luxurious option mainly found on more expensive models, that connects wirelessly to a smartphone to play music during the ride. Some other boards sport a more advanced Bluetooth implementation that allows you to wirelessly make use of a phone app to configure various settings and make changes concerning the board’s performance. These are a must to consult. For anything you can’t test yourself, which will be a lot, go take a look at what others think. Try to find as many viewpoints as possible to compare, and do note that, depending on what stance the person is reviewing from, certain deviations between individual sentiments can be explained very easily. For example, someone looking for a stylish piece of tech to show off with might not be impressed that much by a simple-looking board for tricksters and high-performance riders, but others might be, and writing the board off as useless because of that opinion is not a smart idea. 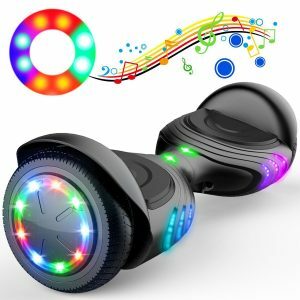 With the help of this broad overview for beginners, we hope you now have a good idea of what a hoverboard is, if it could be something for you and if so, how to go about buying the one that suits you best. There’s a lot of info to take in here, so feel free to consult this article again a few times if you feel stuck. We hope, though, that soon, your friends will be able to call you ⁒ider’, and that you’ll be able to show the whole world your mad skills! Or, perhaps, just cruise through town at a leisurely pace. The choice is yours to make, after all.